Do you buy a lot of those air fresheners that you need to plug into an outlet? Many of the products that are found at the store typically have essential oils listed as an ingredient. This does not mean they are better than a natural product. A clothespin air freshener is a healthier option and is cheaper too. Making a clothespin air freshener is really simple to do. The best thing is, you do not need to prepare a special recipe. You only need to decide what you will want to use as a scent. A few drops of an essential oil is all you need. The process to make your own clothespin air freshener takes about ten seconds. No kidding here. 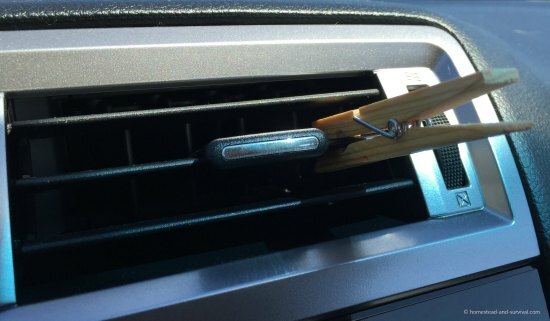 Just add a few drops to a clothespin and secure it to any air vent in your home or in your car. This will work when heat is needed or whenever air conditioning is preferred. Check out the video below to watch how to remove your home air vent and place your newly created air freshener so that it’s not visibly noticeable.